We’ve talked about multi-purpose functional furniture in several other posts. The most recent piece I’ve seen is the Sobro Coffee Table. It has a refrigerated drawer perfect for keeping cool beverages handy. It has built-in Bluetooth speakers, LED lighting, and outlets to charge your devices. It has two other drawers where you can stash all of your charging cables and the remote controls for your television. Plus, it’s sleek modern design will make you think you’re on a live-action movie set for The Jetsons! The Sobro Side Table is currently in development. It has many of the same features as the coffee table — fridge drawer, charging station, and built-in Bluetooth speakers. However, the LED light can be set to automatically turn on when you walk past so you can use it as a nightlight. The non-refrigerated drawer is lockable which is ideal for dorm rooms or shared living spaces. Both of these pieces are rather expensive but in urban centres like Vancouver and New York City where living space is at a premium, multi-functional furniture is more a necessity than a luxury. I quite enjoy the website IKEAHACKERS.NET. If you’re not familiar with it, the site shows modifications on and re-purposing (“hacks”) of IKEA products. Innovative and skilled people from around the world submit their ideas, designs, and creations to IKEAHACKERS.NET. Photos and instructions are published to inspire and motivate the rest of us. The modifications may be as simple as painting a piece or parts thereof, or adding embellishments with a glue gun. Some modifications require disassembling the furniture and using your skills with power tools. Many of the IKEA products are rebuilt to serve a new purpose. Their new book, IKEAHACKERS.NET 25 Biggest and Best Projects presents some of the most creative and popular and contributions to their website since they started in 2006. There are gorgeous photos of the projects which makes it a lovely coffee table book but, there are also detailed instructions that appear much more detailed and easy to follow than original IKEA instructions! This book has a bit of everything. There’s a half-wall lamp with a little shelf that would be ideal for small spaces, a window bench with storage that makes excellent use of otherwise wasted space, and a disguised laundry hamper that keeps visual clutter to a minimum. The skill level of the projects varies. The Double Murphy Bed is a bit complicated for a new do-it-yourself-er, but the String Sided Cabinet would make a great project for a family with school-aged children. 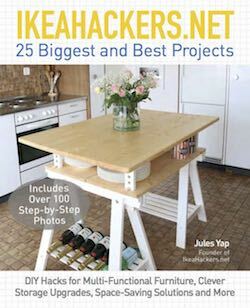 If you’re looking for some projects to occupy your time and you’ve got some unused or underemployed IKEA furniture sitting around, grab, IKEAHACKERS.NET 25 Biggest and Best Projects get your creative energy flowing! When you live in a small home, having multi-purpose furniture is essential. Most people are familiar with sofa beds as multi-functional pieces however, many are uncomfortable as beds and not very stylish as sofas. Vancouver company, Expand Furniture aims to change the way we look at multi-purpose items by providing high quality, stylish furniture that saves space and puts the fun back in functional. My favourite unit is the Compatto, a three-in-one; queen-sized wall bed, revolving bookcase, and table (probably because it makes me think that this would be something that Batgirl used in the 1960s TV show Batman). This is a real space-saving versatile package. The attached dining table would comfortably fit 4-6 people and a 6-inch deep, queen-sized mattress would allow guests to have a good night’s sleep. Watch the video to see how easily this piece converts from one layout to another. 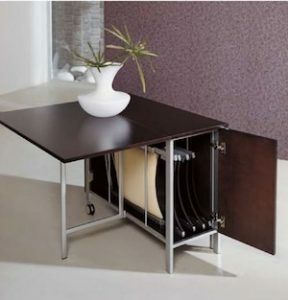 I also like the Trojan console dining table with four hidden chairs. This item would be great if you lived alone and only needed a larger dining table some of the time. It would also be useful in a small office. You could wheel it out only on those occasions when you needed a large work surface or had meetings with several people. The rest of the time, it would be out of the way leaving more room in the office. The video shows how quickly this console becomes a table. 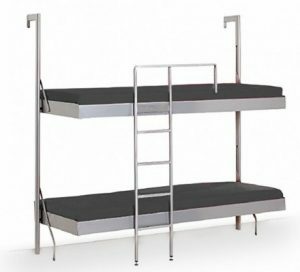 If you have a small space but occasionally have overnight guests, for example your grandchildren, the Murphy Bunk Bed system would be ideal. It includes two mattresses and the rail ladder. It is well-built and sturdy enough for adults to sleep in yet easy enough for young people to set-up and fold away. Also, the top bunk tilts downwards so you don’t have to climb over the mattress to make the bed. When collapsed, the bunks only stick out about ten inches from the wall. The video demonstrates all the features of this Murphy bed system. The process of getting organized often requires buying a set of shelves. Like many other people wanting to get organized, I would go to a department store and buy a heavy, flat-pack shelving unit, haul it into my house, and unpack it. Then, I would have to wait for my husband or children to come home because it always required at least two people to assemble the unit with pegs, screws, and nails — if all of the parts were included in the package. These MDF/pressboard shelves often warped with the weight of books or other heavy items. We’re a military family and move house about every three years and often these shelving units broke or fell apart during a move. We sometimes disassembled and re-assembled them, but it was time consuming and the re-assembled units were never as sturdy as they were before they were taken apart. We ended up replacing many of them over the years — expensive for us and not good for the environment! Now, I have finally found a solution to my shelving problems and hopefully to yours as well — Origami Rack. Just like the traditional art of paper folding, Origami Racks assemble/disassemble by folding and unfolding. There are no tools required! Watch the video to see the 4-tier Garage Shelf set up in ten seconds. It is made from steel and can hold 250 pounds (110kg) per shelf! Origami Rack has other products that are great for inside your home. The Easy Organizer 12-Cube holds 5.5 pounds (2.5kg) per shelf and would be ideal for storing shoes, sweaters, toys, linens, and more. It simply pops open fully assembled. The Origami Computer Desk would be ideal for people who travel for work perhaps setting up at trade shows, or for students who live in small apartments and dorm rooms. The Deco Tiered Display Rack can be used in a bedroom or living area as a stylish organizing solution or in the office as a classy printer stand. The other thing I really like about Origami Racks is most of the products can be fitted with wheels. You only need one person to assemble and disassemble and move these items. If you have a mobile component to your lifestyle, and you have a desire to be organized and productive, make it easy on yourself and consider Origami Rack. Our driveway turns in from the road, runs along the western side of our property and ends near the rear of the house. Upon exiting the car, the walk to the back door is shorter than the stroll to the front. As a result, all traffic — and in and out — happens through the back door. When we purchased the house in 2000, the driveway didn’t exist. Cars were parked in front, and I hung a series of hooks by the front door. It made perfect sense: walk in, hang your keys on the hook. That is, it made sense until we stopped using the front door. I’m a real proponent of “A place for everything and everything in its place,” because my sieve-like brain will forget where I’ve placed the keys (or the wallet or the kids’ snacks…or the kids) if they’re not in their designated home. So I’ve been insisting that keys go on the front-door hooks like a stubborn mule. The problem wasn’t people ignoring the “rule.” The problem was that the rule no longer made sense. I learned to let go and succumb to what the situation was trying to tell me when we repurposed the back room. There’s now an old dresser by the back door, onto which I’ve placed a small leather box that is the new home of keys. We’ve regained the enter-and-drop ease of the old days and more importantly, I’ve learned to listen to the situation. 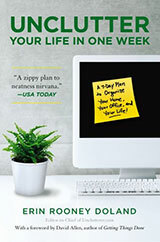 It’s possible to become blindly dedicated to an organizational system. I insisted that we employ a strategy that was no longer effective, simply because I was afraid I’d be lost — or more accurately, my keys would be lost if that system was abandoned. It wasn’t until I stepped back and observed how the situation had changed that I realized the solution should change too. The point is to look around at the solutions you’re using at home and at work. Are they still the best, most effective answer to a clutter issue? Has a situation changed that should prompt a solution change as well? Perhaps that one thing that drives you crazy — a constantly cluttered kitchen counter, the jam-packed junk drawer, phones and tablets piling up to be charged — is simply a symptom of a broken system. Good luck and let me know how it goes. Last week I brought a filing cabinet to the dump. I was very happy to see it go. I bought that cabinet on a whim. It was cheap, small and seemed perfect for what I needed. Less than a year later, it had one drawer that wouldn’t close and four others that had become junk drawers. I hated it, ignored it and used its top to stack papers. It had to go and, more importantly, it taught me how to properly buy a filing cabinet. Today, I know what makes a perfect filing cabinet for me. Here’s what I found. First and foremost, it must fit all of the documents I wish to file and fit into the allotted space in my home office. My work space is a small, second-floor room in a house with dormers, so there’s not a lot of wall space available. Therefore, a traditional vertical cabinet is for me. Perhaps a horizontal cabinet will work best in your space. This really is a crucial first step, so make this decision your starting point. When I say “it must fit,” I mean both physically and within my workflow. Vertical and horizontal cabinets are used differently. A vertical cabinet is most traditional and features two to five drawers. Contents run front to back and face the user. There’s a lot of internal space, but files aren’t easy to get at. A vertical cabinet is a good choice for archival or reference files you don’t look at often. A horizontal cabinet takes up more wall space and offers more interior space than vertical models. The benefit is their contents are much easier to access, so if you’ve got to get at files several times per day, a horizontal cabinet is a great choice. Finally, I make sure my cabinet is within “swivel distance” of my desk. Human beings tend to follow the path of least resistance, so I make it as easy as possible to put something in my filing cabinet: just swivel my chair. Next, a cabinet must be durable. That is to say, I don’t want to be stuck with that one drawer that won’t open unless you yank on it (or shut unless you slam it), the wonky wheel or busted handle. Much of this depends on what the cabinet is made of. The most common materials are metal and wood. A metal cabinet can stand up to years of use and still look good. They are also easy to maintain and come in colors other than the plain beige you’re probably envisioning right now. They’re also easy to paint, so feel free to make it your own. When shopping for a metal cabinet, make sure it has a protective coating to prevent rust and double-walled steel sides for durability. No, metal filing cabinets are not flashy, but they do their job well. Wooden cabinets look great and come in a huge variety of styles. They’re less durable than their steel counterparts, but if you’re in a low-volume office or a home setting, you’ll have it for years before it shows signs of wear. For a high-volume setting, where you’re in and out of drawers all day, go with a metal model. If your chosen filing cabinet sits directly on the floor, consider placing it on a wheeled caddy. This can be very helpful when you need to move the cabinet to clean behind it or rescue your favorite pen. Safety is another consideration. First, I want to keep my documents safe. If you’ll be filing important documents, like a birth certificate or social security card, consider a fire proof cabinet or one that locks (or both). I like to keep these things off-site in a safe deposit box, but if you must store them at home, make sure they’re safe. I also want to be sure that anyone who uses the cabinet is safe. Look for interlocking drawers that will prevent tipping when multiple drawers are open at once. Additionally, cabinets with ball-bearing suspension systems will open reliably for years, so no wonky drawers that you yank open in frustration, risking injury. 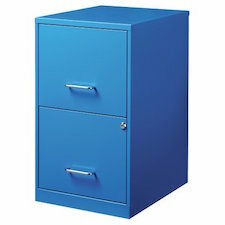 Style, structure and safety are very important when looking for a filing cabinet, but easily overlooked. Like any tool you introduce to your workflow, a filing cabinet should be taken seriously. Happy shopping and let us know what you end up with. I remember the specific look of dread that would cross my father’s face when he would see “some assembly required” on a toy or item we acquired as kids. And I’m pretty sure that look has crossed my face a time or two, as well. Who needs that stress, right? Not dad, not me, and not you. Fortunately, if you’re willing to spend a little extra time and adopt some persnickety behavior, you can say goodbye to the intimidation of “some assembly required” in the future. The key to moving past “some assembly required” anxiety is organization. I follow (and recommend you do the same) these steps, in the same order, every time. Step one is read the instructions completely before beginning. I mean from start to finish, before you lift a single screwdriver or hammer, read all the instructions. This way you’ll know what tools you’ll need, what techniques are expected of you, and how much space and time you’ll need to get things done. Will the kitchen table suffice? The living room floor or even the back yard? Figure that all out before you begin. A plastic bowl. This is used to store screws, nuts, bolts, and any other small, easily lost parts while working. These small bits won’t roll away or disappear into the carpet when they’re safely contained. A designated trash bin. It’s annoying to have torn cardboard, plastic, and other trash in your work area. I always grab a trash can, trash bag, or box to be the designated spot for trash as I work. My smartphone. Occasionally the written instructions aren’t clear. When that happens, I search YouTube for a video that might help. Often I’ll find a clip of someone putting the very thing together and it’s very helpful. You might also want to snap a picture if you discover a broken part or want to keep a copy of any product information. Step three is the persnickety bit I mentioned, so bear with me. In this step you’re going to confirm that all of the parts are present and functional, and get them ready to go. Identify each part against the assembly instructions. Is “Dial A” and “Pole B” in the box? Great. Remove each part from its packaging. Put the packaging in the trash bin. Inspect each part to ensure that it’s not broken. It’s better to make this discovery now, instead of when you’re halfway done. Lay out all of the parts in a neat, easily-accessed grid in your work area. This is the part that makes my kids roll their eyes. I put each part on my work surface in a neat little arrangement. This way I can see and grab exactly what I need instantly. At last, it’s time to put the thing together, and you’re fully prepared. You know what the process entails, you’ve got the trash out of the way, the necessary tools are in place, and each part has been inspected, accounted for, and prepped. This does take a few extra minutes and can seem nitpicky, but it’s worth it. I hope this helps and that you, too, can laugh in the face of “some assembly required” by being well organized as you work. Staying safe while organizing with tall bookshelves, dressers, etc. Bookshelves, armoires, and dressers are some of the common furniture pieces we use to organize our possessions. But if they aren’t used properly, they can cause serious problems. Adult chests and dressers taller than 29.5 inches that do not comply with the performance requirements of the U.S. voluntary industry standard, ASTM F2057-014. The recall followed the death of three toddlers in three years. While the dressers and chests all shipped with wall anchoring kits, the items involved in these tragedies were not anchored. While the Ikea recall got a lot of press attention, it’s certainly not the only product that has this kind of tip-over potential. Other recent recalls include Bestar Dream Dressers (juvenile five-drawer dressers) and a dresser and nightstand in Bernhardt’s Marquesa line. An estimated 38,000 emergency-department-treated tip-over injuries in 2011-2013. Of these, 56 percent involved only furniture falling, 41 percent involved televisions (or TVs plus furniture), and 4 percent involved appliances falling. 430 reported fatalities related to tip-overs between 2000 and 2013. Of these, 37 percent involved TVs falling, 27 percent involved a TV plus furniture, 28 percent involved only furniture falling (with the largest category being chests, bureaus, and dressers), and 7 percent involved appliances falling. Children from 1 month through 10 years were the victims in 84 percent of the fatalities. Existing furniture can be anchored with inexpensive anti-tip brackets. New furniture, such as dressers, are sold with anti-tip devices. Install them right away. Anti-tip devices are sold online and in-stores for prices ranging from $5 to $25. Consumers can visit their local home improvement, electronic or mass merchandise store to purchase anti-tip devices. An online search for “anti-tip strap” or “anti-tip kit” will result in a variety of purchase options. Install the anti-tip devices according to manufacturer instructions, and always double check the attachment points to make sure the device is secure. The campaign also has a poster (PDF) showing how to anchor furniture. While tip-over dangers are often associated with children, who like to climb on furniture, the CPSC report makes it clear that they aren’t the only ones who get hurt by tip-overs. And those of us in earthquake territory have an added incentive to secure our top-heavy furniture. The Earthquake Country Alliance provides good information on just how that can be done for filing cabinets and for bookcases, china hutches, armoires, etc. If you live in a household with children and own tall furniture of any variety, PLEASE take the time to anchor them to your wall. If you have friends who are parents, please urge them to do the same. And if you or they don’t know how to do it, you’ll find plenty of videos on YouTube demonstrating the process. You might need to spend a few bucks on a drill, a studfinder and/or some wall anchors, but it’s money well spent. And I’d add: If you don’t know how to do it and you aren’t horribly handy, you can always hire someone to do it for you. That’s what I did, and it was worth every penny. Ride a helicopter to school! Live in a house made of gold! Have a hundred pet zebras! Today, let’s have a little fun and play the Million Dollar Game for Organizing, Productivity, and Uncluttering. If money were no object, the following are some of the over-the-top products I’d consider introducing to my life. Park your helicopter on your house of gold and pick out your favorite zebra, because it’s time to have a little fun. My first selection would be the Cardok (see picture above). 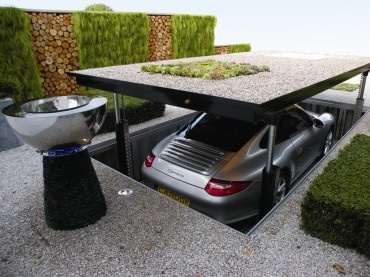 The Cardok enables underground parking on a residential level. Similar to public garages you see in big cities, the Cardok stores your car, out of sight and underground, when it’s not in use. As the website states, you may even maintain a lovely garden on the “roof” when the car is parked. Or pretend you’re Batman. I’d pretend I’m Batman. My next purchase would be a dedicated work building. I have a shed in my backyard, but it’s nothing like what Chuck Wendig refers to as his “…fully armed and operational writer’s shed.” Chuck and his wife converted a typical backyard shed into a stand-alone office, complete with electricity, heat/AC, furniture, and a beautiful paint job. It’s easy to keep your home office from spilling into your house when it’s in a separate building. Now that I think about it, the shed is great but if money were really no object, I’d upgrade to an OfficePOD and add a cool, Mid-Century vibe. 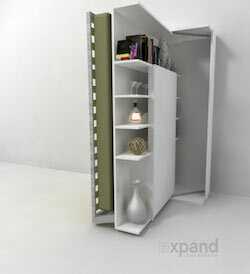 After my OfficePOD, I’d have to install a jaw-dropping, luxury closet. I’m talking about a storage unit with the square-footage of a guest house. Overstuffed furniture to relax on as you decide what to wear, a “jewelry station,” perhaps a mannequin to try clothes on for you, and floor-to-ceiling mirrors. I’d have drawers for each day of the week. “It’s Tuesday, let me get some Tuesday socks.” Add on one of those clothes catalog programs and install an iPad into the wall to run the app, and everyone in my family would be set. Finally, I’d add a Moet Ice Impérial Summer Escape Trunk to my home. When I was young, my family shared a double-house with my aunt and uncle. My uncle had, in his dining room, a modest bar, the front of which was covered with beer cans. As a young lad, I thought it was the coolest thing ever. This massive thing holds 20 bottles of champagne, 24 glasses, two ice buckets, and several compartments for garnishes. Plus, it’s on wheels so you can close it up and wheel it out of site when not in use. It’s no home bar made of Schlitz cans, but it is a tidy way to store massive amounts of champagne and barware. Which we all have in the Million Dollar Game, obviously. This was a bit of fun, yes? What would you pick in the Million Dollar Game for Organizing, Productivity, and Uncluttering? 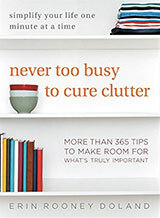 Organizing and uncluttering are ongoing projects because the needs you have and your goals change with time. In my case, a room in my home that was once very useful has stopped being so, and my wife and I have decided to transform it. First, a little background: When my wife and I moved into our home, it had a tidy room just off of the back door that we turned into a dining room. We set it up with a small table, a few chairs and we were good. Later, the kids came along and the table was replaced with IKEA bins for toys, and later still, it took on coats and backpacks. We’ve called the room “the playroom” for the last 12 years. But a few weeks ago, we noticed something odd: No one ever plays in it. In fact, the room was almost completely unused. 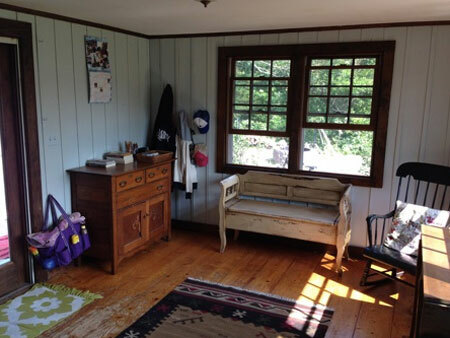 The kids would hang their coats, hats, and backpacks there, walk into the house proper, and not return until the next time they left the house. In addition to being the drop-off point for these items, it also housed our our wall calendar and some seldom-used toys. We didn’t spend much time in there at all and it was time for a change. Now, if you ever find yourself in this situation, you might personally want to consider our advice from 2007: buy a smaller house. But, if you’re like me and moving isn’t a possibility or a desire, I recommend considering how else the room can be used. Do so by observing how the room is being used, and build upon that. The IKEA cabinets went upstairs to hold my own collection of board games. A large IKEA table went to the laundry room as a perfect surface for folding clean clothes. Toys that the kids no longer played with went to charity or to the trash (if not in good enough condition to donate). It felt great to rework this room, and it only took a single weekend to get the job done. It isn’t always obvious when something like this needs to change, but try to recognize that feeling when it comes. 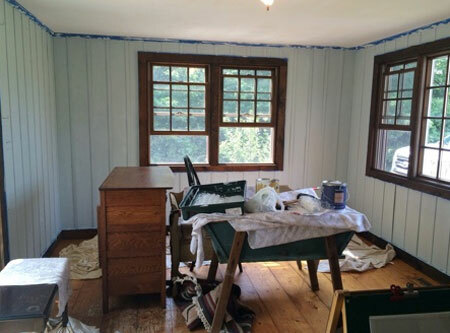 With a little elbow grease, you can turn an “eh” room into something working that you’ll love. I’m currently getting ready to move out of state. I’m retired, and am downsizing everything in my life. I have a piano that my father gave me when I was in high school. He passed away over 20 years ago. I’m moving to a small beach cottage on the Oregon coast. I am struggling with the decision of not taking the piano. I don’t really play it anymore, and feel that it isn’t going to fit in our small home. Somehow, I’m not sure if this is the right decision. What are your thoughts? This is a question I can relate to, as I’ve been on both the giving and the receiving end of a piano. In addition to being a large instrument, pianos can also hold great sentimental value for their owners. Therefore, what to do with a piano can be a difficult decision. First and foremost, pianos are big. Even a small upright piano can be as large as a couch. Inviting one into your home is a commitment, as they’re big, heavy, and difficult to move. Typically, once a piano has been placed in its spot, that’s where it’s going to stay until you move. Don’t get me wrong, a piano is not a burden. It’s a lovely instrument. And, like many other objects, a piano can harbor tremendous sentimental value. When I was in high school and a dedicated music student, my parents acquired a piano from family friends who wanted to offload it. For the price of moving it across town, the piano was ours. I adored it and spent countless hours on the bench, playing away. When I moved out to attend college, my parents were left with a massive piece of unused furniture. I was the only one in the family who played, and while I studied far away in Boston, the old piano back in Pennsylvania was being used to display family photos. After much deliberation, they decided the piano had to go. Nostalgia is a way for us to tap into the past experiences that we have that are quite meaningful — to remind us that our lives are worthwhile, that we are people of value, that we have good relationships, that we are happy and that life has some sense of purpose or meaning. While highlighting the benefits of nostalgia, a 2006 report in Psychology Today magazine has warned that ‘overdoing reminiscence’ risks an absence of joy derived from the present, and a reliance on past memories to provide happiness. If you have no need for the piano, but it holds a great deal of sentimental value for you, perhaps there’s a book of sheet music in the piano’s bench you can display in a quality frame. Maybe the rack that holds up the music can be removed and repurposed elsewhere in the house. For your specific situation, I’d suggest finding a way to display some part of that experience in a meaningful way that will let you say goodbye to the piano itself. As far as getting rid of the actual piano, start by asking friends if they might be interested in having it. Talk with music teachers — at schools, music stores, and those who give private lessons — to see if there might be students who are looking to acquire an instrument. List it on Craigslist or your local Freecycle if you can’t find the piano’s next owner in one of the previously mentioned ways. And, finally, see if the next resident of your home might be interested in having it. It’s very difficult to sell pianos, so prepare to think of it as a donation instead of something with monetary value. Good luck and congratulations on your new home. People who live in small spaces have unique organizing challenges. There may be limited storage space (small closets and no garage, attic, or basement) and limited living space (small rooms used for multiple purposes). The following are some suggestions for organizing in this kind of small space. The same ideas could be used in any space, but they are more important when space is at a premium. Assuming you’re planning to live in the same tiny space for a number of years, it’s time to be extremely selective about what you let into that space. You probably don’t have room for stuff that’s just okay — as much as feasible, limit yourself to things you love. You’ll want to avoid (or limit) those unitaskers, too. You’ll also want to give thought to how many of any one thing you need. How many sets of sheets? How many T-shirts? If you have limited floor space, look to the walls. Can you use shelving (freestanding or wall-mounted)? What about hooks and/or wall pockets? Would a hammock for the stuffed animals make sense? Consider vertical versions of standard storage pieces, too. For example, a shoe tree may work better than a horizontal shoe rack. Many shelving units are 12-18 inches deep; for example, the Kallax system from Ikea (which replaced the very popular Expedit) is 15 3/8 inches deep. If you don’t need that depth, you could get a shelving system that’s only 10.3 inches deep. Look for other situations where a smaller product will meet your needs, saving precious space. You can get collapsible versions of many kitchen items: colanders, whisks, scales, dish drainers, etc. Another example: Gateleg tables fold up into a small space when not in use. Not everyone likes to store things under the bed, but if this doesn’t concern you, consider getting bed risers to provide more under-bed storage space. Paper towel holders can be mounted on the bottom of the upper kitchen cabinets. Shower curtains can have storage pockets. These are just a few of the ways to make use of every bit of space you have. I’ve visited friends who have no kitchen or dining table in their small home, but their coffee table has an adjustable height and it converts into a dining table quite easily. Some of this dual-purpose furniture is on the expensive side, though. If you’re comfortable with digital solutions, you can save a lot of space that used to hold papers, books, CDs, DVDs, etc. Even if it saves money, you’ll probably have to pass on many bulk purchases because you simply won’t have room to store what you’ve bought. Some people manage to find space for a few high-priority bulk purchases (toilet paper, paper towels, cat food cans, etc.) but forego the rest.